North Carolina junior point guard Marcus Paige leads the Tar Heels with 13.9 points and 4.6 assists per game. 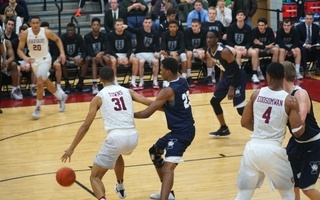 JACKSONVILLE, Fla.—During Wednesday’s press conference, Harvard men’s basketball coach Tommy Amaker said he was glad his players did not notice his reaction when North Carolina was matched with the Crimson (22-7, 11-3 Ivy) during Sunday’s selection show. The numbers back up Amaker’s fears. The Tar Heels (24-11, 11-7 ACC) earned a No. 4 seed in the tournament and have been rated even higher by various metrics. They played 19 tournament teams during the regular season, including three games against eventual No. 1 seeds. North Carolina point guard Marcus Paige was ranked the top recruit at his position when he came to the Tar Heels in 2012. A year later North Carolina added the No. 6 ranked center and a top-10 power forward. The current crop of Tar Heel freshmen includes three players listed in the top three at their respective positions. Of course, none of those numbers will mean anything when the teams face each other at 7:20 p.m. Thursday in the NCAA Tournament’s second round. But they all point towards this game being the second toughest Harvard has played all year, behind only its 76-27 throttling by Virginia back in December. "We also need a team like Carolina to have a bad day or a bad night. So we are hopeful for that too," Harvard coach Tommy Amaker said. The Tar Heels have had off nights late in the year, including losses to Pittsburgh and North Carolina State. North Carolina went on to reach the ACC Tournament final by beating the Cavaliers, but entered that tournament with a 4-6 stretch. The Tar Heels have had success by scoring in droves—it enters Thursday 17th in the nation in scoring at almost 78 points per game and is second in the nation in assists—and by crashing the boards. North Carolina is second in Division I with 41 rebounds per game. The Crimson, meanwhile, rank 260th in points per game and 171st in rebounds. A lot of that has to do with the slow place Harvard prefers (averaging 63.8 possessions per game this year), which has helped the Crimson frustrate opposing offenses in upsets over New Mexico and Cincinnati in the last two years.